Everyone knows that Valentine’s Day is a special day for love, friendship, sweethearts, pretty cards, and flowers, but no one knows exactly how and why it got started. One legend has it that birds choose their mates on Valentine’s Day. Another common myth says that it is celebrated in memory of a Christian martyr named Valentine. He was imprisoned by the Romans in about A.D 270 because he would not give up his Christian beliefs. Prior to his execution, he wrote a note to the daughter of his jailer and signed it, “Your Valentine.”. He was later made a saint, and sometimes Valentine’s Day is called St. Valentine’s Day. Today Valentine’s Day is one of the most widely celebrated unofficial holidays, and a day to let your sweetheart, parents, relatives, and friends know how much you love them. 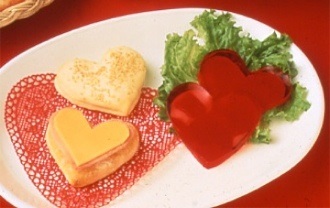 Use a heart-shaped cookie cutter to cut hearts from foods such as biscuit dough or jelled gelatin. Place an open-topped, heart shaped cookie cutter on the griddle and pour pancake batter into the cutter (or you can just try to pour the batter in a heart shape). Trim slices of bread into hearts for a Valentine sandwich. 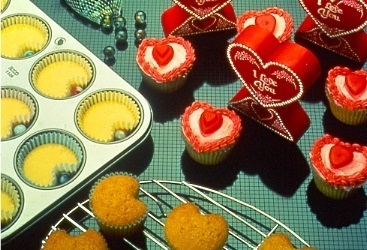 It’s easy to make heart-shaped cupcakes using your favorite recipe! Line muffin pans with paper baking cups and fill half full with batter. Place a marble or small ball of foil in each cup between the paper liner and the pan to make the heart-shape mold. If the cups aren’t about two-thirds full, add a little more batter. Don’t overfill the cups or you’ll lose the heart shape. Bake as usual. Frost the cupcakes, pipe decorative frosting around the outside to further define the heart shape, and decorate with Valentine candies. 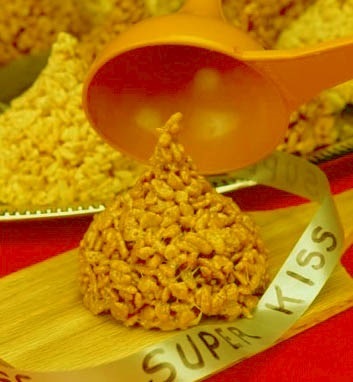 Give someone special a super kiss. Melt butter or margarine in a large saucepan over low or medium heat. Add marshmallows and cook until marshmallows are completely melted, stirring constantly. Remove from heat and add cereal; stir until well coated. Cool slightly, but not completely. Butter your fingers and press warm mixture into buttered plastic funnels and place on a cookie sheet. When cool, unmold and wrap in plastic. Add a flag with a Valentine message taped to a toothpick. Makes two to four large kisses. For more delightful ideas to do with your kids or grandkids, check out Dian Thomas’s fun books. There is a special on her website at www.DianThomas.com. You will find so many wonderful ideas you can make with your little ones. Have fun creating while you make memories that will last a lifetime.